I am a recreational juggler and I love to learn about the glamorous lives of professional jugglers. 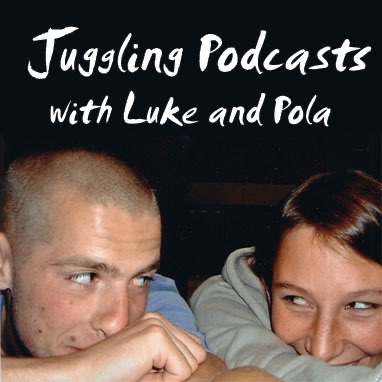 Luke and Pola tell of their juggling and entertaining adventures from Israel, Dresden, Nottingham, Berlin, Sydney, the open sea and more. They Interview Emiliano, Ryo Yabe, Jeff and Wes Peden, Thomas Dietz, Viktor Kee and other movers and shakers in the juggling world. Luke and Pola seem like they'd be great fun to hang out with and I'm sure you'll agree. Pola juggles but she's not as obsessed as Luke so she keeps things grounded. Excellent audio quality; great stories, interviews and reviews. A lot of fun. I take this podcast to work with me and Luke and Pola help keep me focused on what makes me happy.... They're talented, dedicated, have great accents, land great interviews and can make a podcast while watching tv in bed. Thanks Luke and Pola for giving me something to listen to at work besides the same old crap on the radio! I have been waiting for a juggling podcast. Thank you Luke for creating it and I can't wait to see what is to come.